Vehicles participating in drag racing events must be presentable at all times. Vehicles that are improperly prepared may be rejected by a TECH OFFICIAL. Any rider/driver or crew member or person in association with a rider/driver or crew member who is considered to be under the influence of any drug, alcohol or any judgment impairing substance will be expelled from the race and escorted off the premises – along with the entire crew and vehiucle associated with the offender. Speed limit in the pit area, return road and other areas is 10 MPH. Burn-outs are not allowed anywhere except in the burn-out box. Violators endangering others with reckless and inconsiderate driving habits (whether it is in/on a race vehicle or a pit vehicle ) will be expelled from the race facility with the entire crew and race vehicle. When racing, shorts, bare legs, tank tops or bare torso are prohibited in all classes for safety reasons. Upon entering, racers agree to abide by the aforesaid rules and that all interpretation of rules, questions and protests are left up to the final discretion of the race officials and may be changed if the situation warrants action. In any event, the RACE DIRECTOR has the final word. 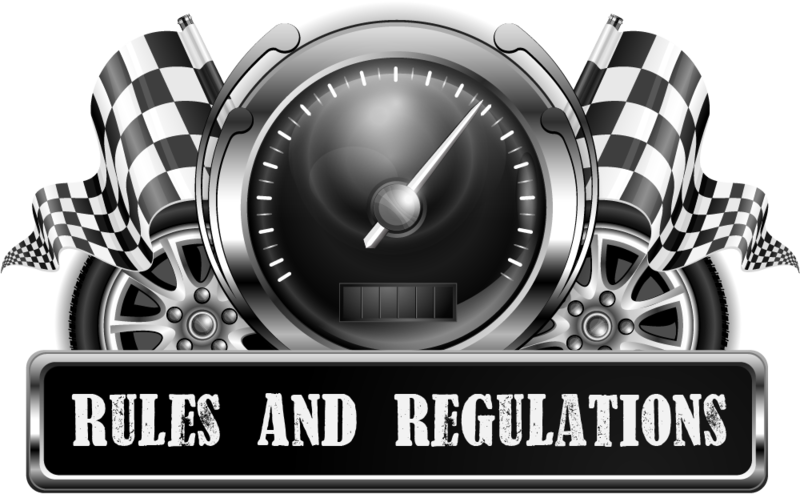 We recommend you purchase a NHRA or IHRA Book, which contains all rules governing racing activities and safety requirements at the facility. N.H.R.A. rulebook will be used for technical and safety guidelines. Drivers may dial to the hundredth of a second. Racers must be ready when they come into the burn-out area, with helmets on and harness/seatbelt fastened. BURN-OUTS are NOT allowed in the pits, staging lanes or return road. Oil spills or anti-freeze spills on paved areas in the pits must be cleaned up or pointed out to officials. Some of our pit area is a critical part of the airport and must be in usable condition at the conclusion of the drag event. Failure to co-operate in this area may result in disqualification from future competition. No passengers are allowed in any class. Safety neutral switch is mandatory for all classes. The age of eligibility for the Juniors is from eight years old to seventeen years. An exhaust is required for Street class. Street slicks are allowed in Street class. One minute “BREAK RULE” is effect. If a car fails to fire or is broke, they have one minute to make it to the starting line or they will be dis-qualified. In case of a break-down, drive the car one car length off the track. NOTE – THE RACE DIRECTOR MAY WAIVE, AMEND, OR MODIFY ANY RULE AT ANY TIME FOR ANY SINGLE OCCURRENCE, FOR ANY GOOD CAUSE. Tow vehicles and race cars in the pit area only! Saving pit spaces will not be allowed. A Tech Inspector will check your race vehicle for safety and to ensure that all races vehicles are in their proper class, according to NHRA rules. This form must be signed by all drivers, participated and crew entering the restricted area. Those without proper wristbands will not be allowed to enter the restricted area. Before pulling into the staging lanes make sure your vehicle has been teched. Come to the lanes only when your class and assigned lane is called. When your lane or class is next, make sure you are ready to race, be sure your helmet is on, your seatbelt/harness fastened properly and all windows are up. When eliminations begin, competitors will leave the staging lanes only when indicated by the Staging Lane Official. When each class has 16 or fewer participants they will be put on a ladder and lanes are chosen by a coin toss. The ladder will be available in the buy back booth. There will be one bye-run pulled by the Staging Lane Official prior to every round of eliminations. That driver will be set aside until the last pair leaves the lanes. If one still remains, that driver will run the previously selected bye-driver. It is possible to have more than one bye-run a day. STOP before entering the burn-out box. Wait until instructed by an official to proceed to the water box. Drivers can give the clock operator time to read their number and dial-in from the tower control room and enter it into the computer to time the race. “Dial-in” numbers must be clearly visible from the control room in the tower. Poorly displayed numbers could be mis-interpreted by scoring staff. If the dial-in time displayed on the dial-in boards is incorrect and you proceed to stage your vehicle then you have accepted the time and the race is official. Your competition number needs to be 6” high, 1 ½ “ wide, with class designation 3” and 1” wide. Numbers need to be displayed in a legible manner in a contrasting colour (preferably white) to the vehicle background and located on both side windows, and right side of windshield. Drivers may change their dial-in at any time during eliminations prior to entering the burn-out box. , SLEDS, AND BIKES ONLY may report dial-ins to the track official entering the staging lanes. Check your dial-in on the dial-in boards prior to staging your vehicle. If your dial-in is not correct, DO NOT stage your car. If you stage your vehicle, you are accepting the dial-in time in the computer and the race is official. If your opponents dial-in is incorrect for the class he is in. Do not stage or you are accepting his dial-in time and race is official. Point out the problem to race official and clock operator will fix problem, opponent must accept towers dial-in or he will face disqualification. (also known as the water box) Drivers will be guided into the burn-out box by a Track Official operating this area. Start your burn-out only when the starting line staff instructs you to do so. Burn-outs are allowed in the burn-out area only. They are completed in a forward motion only. Crew members are not allowed to hold the car during a burn-out. Open-bodied vehicles and vehicles not equipped with front brakes are allowed to cross the staging lights during their burn-outs. Failure to adhere to this rule could result in disqualification. When indicated by the official starter, move forward until the top small yellow light on the “Christmas light” is lit. Inch your vehicle forward until the small yellow light on the “Christmas light” (stage) is lit. Prepare for the three amber-colored lights to count down to the green light. (Leave on the 2nd or 3rd amber light depending on the reaction of you and your vehicle). Once both cars are staged, the starter will activate the Christmas tree (after a 5 count), and the race will be start. If you roll out of the beams, it will be considered an automatic loss. If you back-up, you lose! GO!!! If your vehicle has problems, pull to the outside of your lane, by one car width, and stop. If you are still mobile, always clear racing surface before stopping. If you “red-light” – which is an automatic loss during eliminations – DO NOT slow down and hold up the next racers. Imagine how that distraction might affect you if you were the next one coming to the line. Towing vehicles are permitted. Drive past the finish line. DO NOT DRIVE OVER THE CABLES. Do not put your vehicle in neutral. Slow down quickly enough to make a safe turn to the return road. Get off the track quickly. Be careful when turning, look for unexpected traffic and allow for a safe exit. If experiencing stopping problems, GO STRAIGHT. Never attempt to turn while travelling at the high speed. Drag cars are built to go straight, not to turn corners fast. Ensure that you have control at all times, if possible. Race cars will exit to the left. Do not speed (10 MPH limit) and follow posted signs. Violators will be penalized which could result in disqualification. During regular race events time slips are to be picked up by racer/crew member at the time ticket booth. The time slip tells you your reaction time, 60’, 1320’ elapsed time and 1320’ MPH speed. The time slip also gives you the same information about your competitor. It will also tell you the winner during eliminations. A perfect reaction time is a .500 perfect tree. Once your race is over, go back to your pit area. Wait for the announcer to call your class (PA system and FM broadcast) before heading back to the staging lanes for your next run down the racetrack. Also, classes are run in order: Street, Sportsman, Motorcycle and Drag Sleds, , Junior, Semi-Pro, and Super-Pro. This order is subject to change due to weather conditions. Finalists will receive their trophies and cheques in the post-race presentations immediately following the last race. If a re-run is required, then the lanes and dial-in times will remain the same, unless mutually agreed to change by the drivers involved in the re-run. Once the vehicle is staged, crew members must stand to the rear of the starter point. All fourteen to seventeen year old crew members need to sign a minor release and waiver of liability form. These forms are at the front gate. THE TOWER IS OFF LIMITS. The Staff in the tower have a lot of work to do to make sure that the races run smoothly, and shouldn’t be interrupted. If you have a problem before or after the races, see Pit boss or race Director. DO NOT BE complaining, yelling, or swearing at the Track Staff at the gate, in the tower, at the time-slip booth and/or at the starting line. Remember that we are volunteers. If you are disrespectful you will be escorted out and banned from our track. All vehicles in competition require seatbelts. Drivers of all vehicles, except Street, are required to wear an approved helmet with current valid certification. All bikes, four-wheelers, pit/support group transportation must be identified with the competitor’s numbers of your race vehicle. Drivers of any form of transportation must be licensed and sixteen years of age or older (excluding the Junior class during time trials and eliminations). Vehicles must be used in a safe manner during time trials and eliminations. If a racer breaks down during test and tune ( on Friday only), the racer will be reimbursed for half of entry fee , no refund for test and tune. If a racer breaks down during the first round of time trials, there will be no re-imbursement. There will be no refunds, in case of rain-out.